Saturday Night Takeaway - New Microgaming Slot at 32Red Casino (2017-03-16) Hungry for some Saturday night fun, any day of the week? With Ant & Dec`s Saturday Night Takeaway, everyone`s favourite Geordie duo aren`t just back on the telly - they also take centre-stage in 32Red`s brilliant, brand-new video slot. 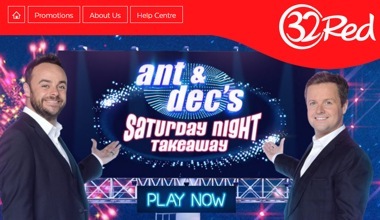 The ever-popular Ant & Dec show is heading to a desktop, tablet or mobile screen near you. This Saturday Night-themed slot makes the competition look like a wet Wednesday washout. Alien Spinvasion Is Coming Soon at Slots Capital and Desert Nights Casinos (2017-03-10) Rival Gaming is set to launch a new 50-Line, 5-Reel Slot "Alien Spinvasion" on all Download and Instant Play, and "Alien Spinvasion Mobile" on all Mobile platforms! The game will be available 13th March 2017 at Slots Capital and Desert Nights! Look to skies and brace for attack in Alien Spinvasion, Rival`s latest 5-Reel slot. The Army General has his finger on the Button, ready to retaliate against the menacing Alien Spacecraft. 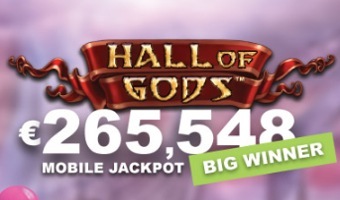 Hall of Gods Mobile Slot Pays Out €265,548 Jackpot Within Weeks Of Release (2017-03-08) The Hall of Gods mobile slot launched only a few weeks ago, records it`s first jackpot winner as Amanda walks away with €265,548 in cash. For Amanda, the dream of new Porsche came a reality, when on Sunday 5th of March, she walked away with one of the 3 progressive jackpots in the Hall of Gods mobile slot at Vera&John. Amanda wasn`t in the frame of mind to face that reality just yet. She turned to her boyfriend, stared into his eyes, touched his arm lightly, and said in soft husky tones "Hey, wanna play slots?" Amanda didn`t have a huge budget, but was happy to spend a little to get that quick big gambling thrill. Dollars to Donuts Slot Is Coming Soon To Slots Capital And Desert Nights Casinos (2017-02-14) Rival Gaming is set release a new 5-Line, 3-Reel Slot "Dollars to Donuts" on all Download and Instant Play, and "Dollars to Donuts Mobile" on all Mobile platforms. Coming soon to Slots Capital and Desert Nights on February 22, 2017. Dollars to Donuts is Rival`s latest sweet playing slot - The latest "sure thing" in their 3 reel suite. What makes Dollars to Donuts a "sure thing"? Firstly, it`s a classically styled, easy playing 3-reel with 5 pay lines featuring a traditional icon set of bars and sevens. Batman V Superman And 2 More Mobile Slots From Playtech (2017-02-08) After months of speculating, we can officially announce that all future DC movies and TV shows will get the Playtech slots and games treatment, available on mobile and desktop platforms. Playtech is launching a whole series of classic Batman TV series slots. These turned out to be a huge success, with Batman & The Joker Jewels being the crown prince of the series, despite their slightly corny 1960s vibe. 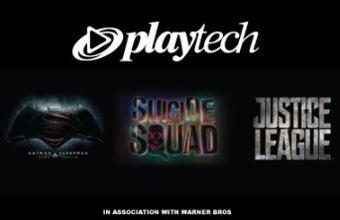 Mor Weizer, CEO, Playtech, stated: "This is a hugely significant deal for Playtech and we?re delighted to have a wider-reaching exclusive DC film- and TV-branded content licensing agreement with Warner Bros.
HTML5: The Ultimate Mobile Casino For iOS Is Available At All Slots Mobile (2012-08-27) HTML5 is here! This August All Slots Mobile have launched new HTML 5 mobile casino application. We are thrilled to announce that the new HTML5 mobile casino web application is now live and is already bringing in amazing results. This amazing brand-new product is optimized for the iPhone and iPad users. The following devices are supported: - iPad 1, iPad 2 - screen resolution: 1024 x 768 px - iPad 3 - screen resolution: 2048 x 1536 px - iPhone 4, 4S - screen resolution: 960 x 640 px The following operating systems are supported: - iOS 4 and 4.x - iOS 5 and 5.x All traffic from compatible iPhones and iPads is being automatically directed to the new HTML5 mobile casino site, leading players seamlessly to the ideal platform for their device. New Real-Money Bingo And Slots App On Facebook From Jackpotjoy and Gamesys (2012-08-22) U.K. based Facebook users aged 18 and over are now able to play games for real cash prizes. New Jackpotjoy application by Gamesys is launched, so online and mobile players can now enjoy Bingo & Slots Friendzy. Spin, Chat and Win with Jackpotjoy Slot Machines, home to the best variety of Slot Games on Facebook. Gamesys, which operates popular U.K.`s bingo and slots website Jackpotjoy, has marked itself in the history books of online gaming with the launch of its new Jackpotjoy gaming app, Bingo & Slots Friendzy, on Facebook`s U.K.
23 Games on All Slots for Android, $5 Free Bonus And Mobile Winners (2012-05-02) All Slots Casino for Android In the 6 weeks since the launch of All Slots` new mobile casino app for Android devices, there have already seen great take-up and activity on this platform. With the increasing popularity of Android smartphones and tablets, this comes as no surprise, and this mobile casino app is truly superior to what was previously available, with amazing graphics and full sound effects. Mobile Casinos Set to Overtake Online Casinos Within 5 Years (2012-04-19) Mobile phone casinos are fast becoming the choice of remote gamblers in comparison to online casinos! After many promised years of industry hype and ambitious forecasts, 2012 is the year which has seen the mobile casino boom finally delivered! Recent industry research confirms that there has been a huge rise in players` bases that are now choosing to use mobile casinos because of their accessibility, playability, ease of use and huge rise in popularity. The New Android Casino and 5 Credit Bonus for All Slots Mobile Casino Players (2012-03-12) I`m thrilled to let you know that All Slots` new mobile casino platform for Android mobile devices is now live! Supported by smartphones and tablets running Android version 2.2 (a.k.a. "Froyo") and higher, this application runs on Adobe AIR and includes 22 casino games with high definition graphics and full sound effects ? features not available on other mobile casino platforms. The user experience closely resembles that of the Viper online casino (Microgaming software), in that the player downloads the software and logs in to a central lobby where he can choose a game to play.